THIS IS ANOTHER PHOTOGRAPHY LIFEHACK. At one time, life was simpler; there would be just one family camera, and it would take all the pictures of the children growing up, the holidays, the life events. But now, things are considerably more complicated because we can take pictures with a range of devices. In our household at the moment, my daughter can take pictures with her pink camera, her phone, and her Nintendo DSi. My son has a blue camera, a DS, and an underwater camera. We still have a family camera that takes videoclips as well as jpg files, and of course, we have smartphones, videocameras and probably more things if we really thought about it! Each device labels each photograph and video file in an unhelpful way – something like 023456IMG.jpg – and we would rather not spend time renaming and tagging all this stuff – so what’s the best way to organise our data? What is the best way to manage photographs and video clips? Well, for us, the answer is to use a free program called IRFANVIEW. This may be downloaded from irfanview.com. 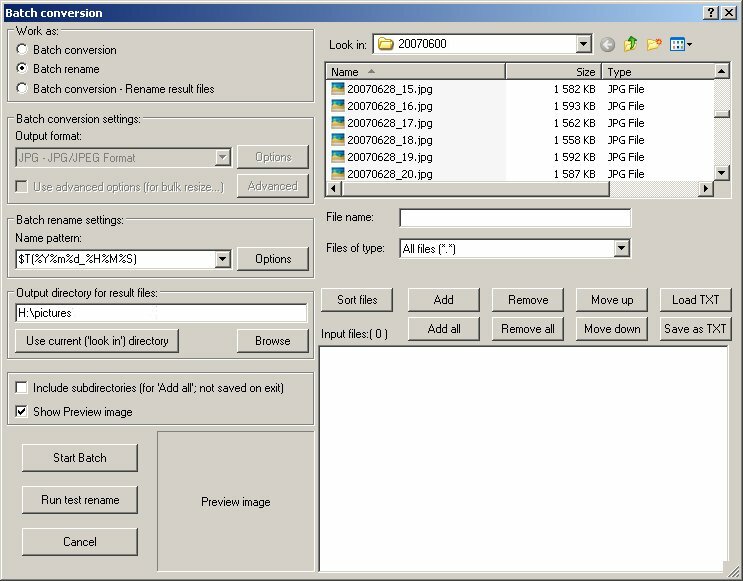 Put a batch of pictures and clips in a folder, download and install irfanview, then select a picture (a *.jpg) in Windows Explorer – right click and select “Open with…” then pick irfanview. When the picture opens in irfanview’s viewer, type in the letter “b” from the keyboard to do a batch rename. There is a special code that converts the filename into a date and timestamp, regardless of what device was used to take the picture or clip. This is year, month, day, hours, minutes and seconds, it is very unlikely that two photographs would be taken at exactly the same time, so it is a great way to rename all your files from all your devices – it sorts them all chronologically, but the EXIF information (the data about the camera used etc) remains intact. Simply “Add all” and let the batch run. All the files are renamed! Simple. If tagging is important (hidden – but searchable – data about the location, who is in the photo, etc), then the long-term quickest way, I think, is to use Google’s picasa program. It’s free to use, download it from picasa.google.co.uk. Once downloaded and installed, let it look through all your pictures. It will recognise human faces and offer them to you to tag. That is not as laborious as it sounds; it learns who the person is (somehow), so when you tag a face once, it looks through every picture you have to find and tag that person’s face wherever it finds it. Brilliant! Of course, there will be times when it is not sure, so it will ask you to confirm that the face it thinks is someone is actually correct. Now, once the program has done all that, it can display groupings. You can see a group of pictures containing a particular person. You can then select all of them and add that person’s name as a tag. A proper image tag. A tag than can be uploaded to flikr or read by anyone’s device. In Windows 7, you can tag pictures in Windows Explorer, so you can add a tag for a holiday batch or whatever you fancy. I like to get computers to do the work; I have a life. That is what computers are supposed to be for, isn’t it? I use irfanview to rename all my files chronologically and uniquely. I use picasa to recognise people and group them for tagging. I use a python flikr uploader script (see My Lifehack#2) to take the pain out of uploading loads of files to flikr. I use flikr to organise, group into sets and collections, to share and to back-up all my stuff to the cloud. It is all completely free of cost too. Free and easy. Takes no effort nor time once set up; the computer does all the hard work for you. And that’s how it should be; it lets you get on with more fun things in life. Enjoy! This entry was posted on	2013-03-04 at 11:47	and is filed under Anecdotal, Ideas, pictures, Video.